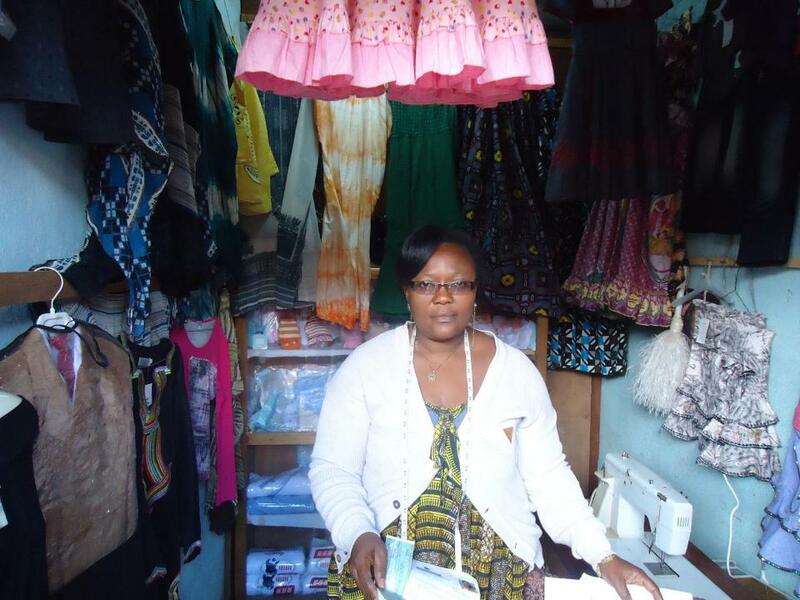 A loan of $400 helped to buy and make clothing for sale. Evelyne is a 43-year-old married woman who runs a business selling baby clothes; she also makes clothes and has sold them at a local market for five years already. Thanks to this, she has gained good experience in the field, which will allow her to develop a good reputation. With this loan, she would like to buy clothes to increase her current stock of merchandise in order to better satisfy the demands of her customers. She would also like to buy fabric and thread, which constitute the raw materials for her clothes-making business. The income from this business will allow her to help her husband provide for the family. Her business ambition is to buy school uniforms to sell in order to diversify her products and eventually expand her business. Evelyne est femme mariée et agée de 43 ans. elle exerce comme activité la vente de layettes; de vetement et fait également de la confection qu'elle vend dans un marché de la place depuis 5 ans deja. céci dit, elle bénéficie d'une bonne expérience dans le domaine, ce qui lui aura permis de se faire une bonne reputation. elle voudrait avec ce crédit acheter des vetements pour augmenter son stock de marchandises actuel afin de mieux satisfaire la demande de sa clientèle. elle voudrait aussi acheter des tissus et des fils qui constitue la matière première pour son activité de confection. les revenus générés permettront d'aider son époux à supporter les charges familiales. elle a pour ambition pour son activité d'acheter des tenues scolaires pour les vendre afin de diversifier ses produits et d'agrandir à terme son activité. This loan is part of ACEP Cameroun's loan program targeting poor clients who require smaller loans thant ACEP normally disburses. The smaller loan size allows clients with micro-enterprises to borrow and repay the funds they need to grow. By supporting this loan, you are expanding financial access to entrepreneurs with very little starting capital, including many who have never taken out a loan. Agence de Crédit pour l'Entreprise Privée (ACEP) is Kiva's second Field Partner in Cameroon. Founded in 1999, ACEP has developed a strong lending methodology to serve entrepreneurs and farmers across Cameroon. Kiva represents for ACEP an opportunity to provide a product aimed at vulnerable women at sizes and guarantee policies that otherwise would be beyond their methodology. For these loans, ACEP has also drawn up plans to offer business training courses. Kiva believes that the existence of a professional, proven MFI serving this vulnerable group will have great social value in the Cameroonian market.